Running short of time to test? Then you need to learn about the Minimal Essential Testing Strategy below. Editor's Note: We are pleased to present this article by Greg Paskal, CTFL. Greg's innovative strategy described below is a great example of the type of risk assessment that is referenced in the syllabi for the ISTQB Foundation, Agile and Advanced Test Manager certifications. As the moving truck pulled away from our newly rented house, I pondered this new adventure we had begun. I was happy our family was back in Southern California, and this job with Kinko’s Corporate Offices would introduce me to an engineering field I’d never worked in before—the world of Quality Assurance. Some time progressed, and I thought I had this QA thing figured out pretty well. Then an email came, followed shortly by a phone call: “Greg, I need you to test this change. It needs to go live in an hour.” I thought, Wait a second. That’s not the way this works. I get a day or two to test things, and then I let you know when everything is good to go. What’s with the fire drill? As it turned out, the changes were important, and I was able to get everything tested quickly enough to meet our deadline. When the dust settled, I realized this would likely not be the last time this scenario would arise. So I began considering how to better prepare for the next emergency change. My efforts resulted in a simple list of items to test when time was scarce. Before long, my list grew to fill an entire page, and I realized a different format for this information was necessary. Translating my scribbled notes into a spreadsheet, I realized some things captured were not as important as other things. So I added a second column for these less critical tests. In doing so, I realized not all tests have the same importance given the urgency of the moment. I decided to call my testing strategy the Minimal Essential Testing Strategy, or METS for short. METS continued to evolve over the next couple of years, including added columns to capture categories and importance levels identified as Critical, High, Medium and Low. METS was maturing, and I had an excellent tool to capture more tests as I identified them along the way. METS began in the early days of the web, but it continues to keep up with mobile and other technologies to this day. QA engineers can really take advantage of a tool like METS. It enables smart testing with quick turnarounds of work requests and allows QA Engineers to adjust their testing efforts midflight as testing is happening. METS can also complement other testing strategies and provide options within a testing organization, helping them to adapt to real-world testing challenges. Let’s talk about what it takes to get started with METS for your testing needs. Imagine you’re going to build a METS testing strategy to test a minivan. Let’s begin by viewing this minivan from two different perspectives: Physical and Functional. Physically, we observe Tires, Glass and Lights. Functionally, we expect Acceleration, Lighting, Stopping and Cooling. All of these are important aspects of a minivan. Let’s prioritize our tests to add them to the METS Physical Test Grid category related to Tires. It’s critical that the minivan has four tires. It’s of high importance that the tires are in good condition. It’s of medium importance that the tire pressure is correct. It’s of low importance that the tires are balanced. This is what the information would look like placed in the METS – Physical Test Grid. Next, let’s prioritize tests we would add to the METS Functional Test Grid category related to Stopping. It’s critical that the minivan completely stops. It’s of high importance the minivan stops in the expected time frame. It’s of medium importance the minivan stops under wet conditions. It’s of low importance that the minivan stops using the emergency brake. This is what the information would look like placed in the METS – Functional Test Grid. By considering the vehicle from both the Physical and Functional perspectives, we come away with different tests that are unique and important to the workings of a minivan. In the same way, when considering our application under test, we identify tests that ensure our product is both Physically and Functionally working as designed. These two groups will become the categories of your METS Physical and Functional Test Grids. 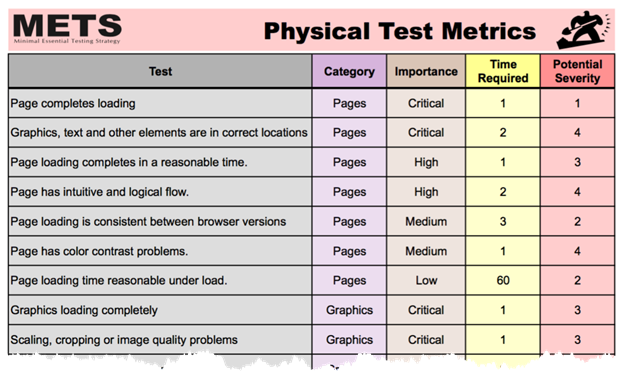 Once these categories have been added to your METS Test Grids, capture Critical, High, Medium and Low tests that would align themselves with each category. Keep these simple. You’ll discover more as you use METS on a regular basis. Note: Keep details for tests brief. METS should guide the QA tester who is likely a subject-matter expert of the application. Below are examples of a Physical and a Functional Test Grid. Remember: To build these, you first capture the Categories, and then you identify appropriate Critical, High, Medium and Low tests. Note: Remember, the difference between these two METS grids is the perspective of how you view the application under test. The Physical Test Grid contains the items you can touch within the application. The Functional Test Grid contains the items you experience within the application. Once the basic METS documents are created, have your team begin using them to guide their daily testing efforts. Testers should begin with the Critical tests and progress to less important tests as time allows. Note: Like many QA engineers, when I first began testing I believed I needed to test everything and execute every single test. METS helps alleviate this problem by providing priority and order to the most critical items to test leading to less critical items. In a typical testing engagement, it’s unlikely every test in the METS Testing Grid will be executed. Test team leaders should encourage their teams to add to their METS documents as they identify new tests. Many teams publish their METS documents to online or cloud-based tools, enabling centralized access, execution, searching and maintenance across the entire METS test suite. Bring awareness to development teams and customers regarding your METS Testing resources and teach them how to utilize them. Recognize that each user of the METS process may identify tests previously not considered. Put into place a simple process to capture test ideas and concepts for new categories and groups of tests. METS Testing resources mature over time and will become an invaluable part of your test toolset. After using METS for a number of years, I started to find other creative ways to get more out of these tools. I recognized that each test had unique metrics that could be captured. For example, taking the METS Physical Test Grid and breaking each test into a single row provided the ability to capture details about Importance, Time Required and Potential Severity. These metrics can help bring greater awareness about where to focus testing efforts. With some creativity within your spreadsheet application, you can use these and other added metrics to help estimate projected execution times and other valuable information. Many QA teams begin with METS as their initial testing strategy. As teams mature and recognize the need for documenting detailed test cases, METS can bring guidance and order as to where to begin this important process. Move from critical to less-critical tests in your documentation efforts. The initial METS documents created along with manual test cases will provide a great structure to follow for new hires and contractors. This will help them to quickly ramp up and apply their testing efforts in the right places. With test automation becoming essential among QA teams, it’s critical to know what tests should be automated. Leveraging the insights from your METS document can provide direction to great test automation candidates. Focus your automation efforts on the critical column as a place to begin. By building out test automation to cover all your critical METS tests, you have an exceptional, automated first line of defense that can be executed against the application daily. Tip: In many cases, automating just the critical test of your METS Testing Grid will be significant enough to identify a good number of defects. In my experience, running this automated test suite daily leads to finding many defects and also ensures the test environments are in good working order. An organization can save hundreds of valuable testing hours leveraging this technique alone. METS continues to be an invaluable tool in our testing organization. I suspect it will continue to provide new advantages not yet considered, and I am certain it will add value to your testing toolbox as well. For more information about METS, please visit http://www.metstesting.com. Greg Paskal is a natural innovator, pioneering new approaches across the Quality Assurance landscape. Greg enjoys mentoring others in highly sustainable, maintainable approaches to manual and automated testing. Author of Test Automation in the Real World and StickyMinds.com publications, Greg can also be heard on the TestTalks podcast with Joe Colantonio. Learn more about Greg at MissionWares.com, GregPaskal.com and RealWorldTestAutomation.com. According to LinkedIn, ISTQB Certification continues to be #1 among software testers listing certifications on LinkedIn. That's not surprising, of course, as ISTQB Certification has more than 400,000 software testing certifications issued across 70+ countries. Let's keep the momentum going. If you haven’t done so yet, join the new, "Official" ASTQB LinkedIn group right now. Scroll down to the Certifications section and click Add certificate. Complete the prompted fields and click Save. See informational postings in the ASTQB group, including a nice piece by Philip Lew, CEO, XBOsoft on the topic, Do We Need Software Testing Standards and Certifications? The official, online, searchable “List of ISTQB Certified Testers in the U.S.” as certified by ASTQB. Career advice, including how to get a software testing job (or your next job/promotion). Scholarship opportunities for those pursuing a degree related to software testing. Internship information for those seeking to enter the software testing field. 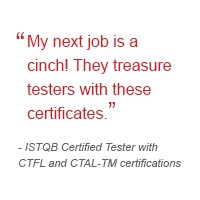 And for those of you seeking to hire quality testers, the ASTQB Career Center lets you search for ISTQB certified testers. 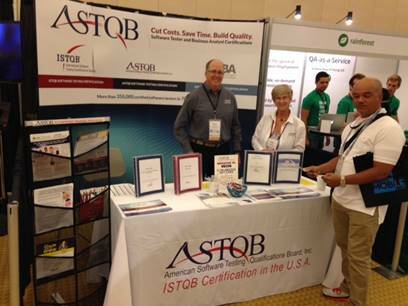 ASTQB has again been traveling throughout the country promoting certification and software quality, making your ISTQB, ASTQB and IQBBA certifications more valuable than ever. Special thanks to our volunteer ASTQB Directors who give so much of their time and expertise to make ASTQB the leader in U.S. testing certifications! See the photos below. at the Mobile & IoT Dev and Test Conference in San Diego. 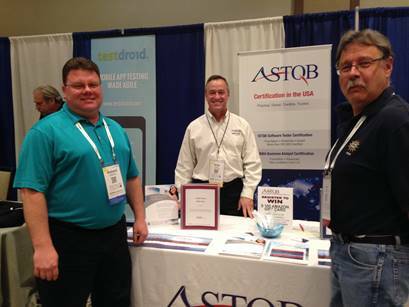 Pictured above, ASTQB Director Greg Collina volunteers at the table as he visits with Rich Kern from UPS on the left and Jon Hagar of Grand Software Testing on the right. At the Agile Development, Better Software show pictured above, ASTQB Director Earl Burba, CTAL Full, CTEL-TM Full and ASTQB Exec Lois Kostroski are speaking with Technical Advisory Group member Mike Prisby, CTAL-TM, CTEL-TM Full from UPS. ASTQB is promoting the use of the ISTQB syllabi for increasing the number of software testing courses in institutions of higher learning. This was our first time at ICST, the International Conference on Software Testing. Pictured above is Dr. Mark Grechanik, University of Illinois at Chicago, ICST General Chair, and ASTQB Director Tauhida Parveen, Ph.D., CTFL, CTFL-AT, CTAL-TM of Keiser University. This was also our first year at ICSE, the International Conference on Software Engineering, a forum for researchers, practitioners and educators to present and discuss the most recent innovations, trends, experiences and concerns in the field of software engineering. Pictured above, volunteer ASTQB Director Rex Black prepares the booth before the show starts. We look forward to seeing you at other upcoming shows such as STPCon, STARWEST, and Better Software / Agile Development Conference East. 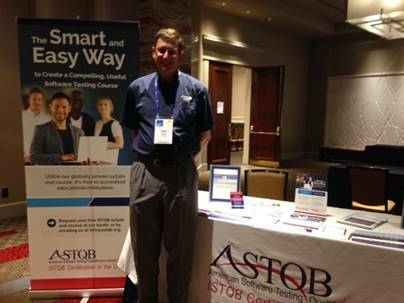 Be sure to stop by the ASTQB to say "Hi!" Security is more important than ever for both your career and your company. If you are looking to take your career to new heights, the new Advanced Level - Security Tester certification is the perfect next step. Learn more about this new ISTQB security tester certification, and watch for more more information coming soon! ALPI: SAVE with multi-person discounts for ISTQB training / certification, Microsoft test tool training, and HP test tool training / certification. Get peace of mind with our exclusive "ALPI Free Refresher Guarantee." 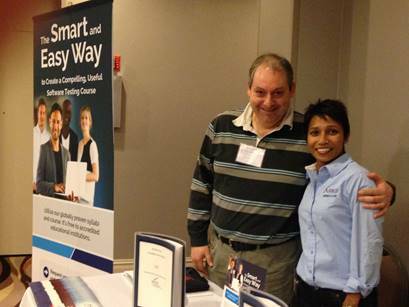 Contact our Training & Education team for details at training@alpi.com or by calling (301) 654-9200 ext. 403. Choose from DC Metro, Denver Metro & Live, Virtual classes. This offer expires Aug. 17, 2016 so email or call right now. ASPE Training: On-demand, self-paced eLearning courses from ASPE are delivered exclusively online in short, easy-to-absorb video based modules with exercises, required readings, and assessment questions to enhance your comprehension along the way and are available around the clock. Now until the end of August, get any of our self-paced eLearning courses for 50% off with code ELEARN50. Courses include but are not limited to Fundamentals of Software Testing and eSoftware Tester Certification. Learn more at aspetraining.com/self-paced-elearning. Coveros, Inc.: Coveros is excited to present our popular and newly accredited Mobile Application Testing for Test Professionals (MAT) Course. This class will prepare you for the ASTQB Mobile Tester certification exam. Public classes this quarter include Live Virtual MAT 8/16-18 and F2F MAT in Washington DC 9/21-22. Visit www.coveros.com/solutions/training for more information about this and other education opportunities. We will also come to you! Email training@coveros.com for course information, quotes, and discounts. GSA GS-35F-147DA. RBCS: RBCS' ASTQB Mobile Certified Tester live course was recently released. Our e-learning version of the course is in high demand and well under development. It is expected to be released soon. Purchase your course today to reserve your registration for the course and save $200 off of the regular price of $599. Visit our store today to take advantage of this limited time offer! Rice Consulting Services: Rice Consulting Services is offering a special discount of 15% on upcoming ASTQB Mobile Tester Certification courses in either live virtual or e-learning formats. Use code "MOBILE15" at www.mysoftwaretesting.com when purchasing your registration. This offer expires on August 15, 2016. SQE Training: SQE Training - Extend your certification and maximizing your training at one of SQE Training's Software Testing Training Weeks. Choose from up to 16 specialized courses—including ISTQB® accredited Agile Tester Certification and the newly ASTQB accredited Mobile Application Testing - to build a perfect week of training. Upcoming training week locations include Dallas, TX, Washington, DC, and Tampa, FL. Register by August 31, with code QBTWK to save $250 on any single course. *Restrictions apply; only valid on new registrations.